Known as the ‘Rose of Japan’, the camellia has been the center, for more than a decade, of one of the most famous tourist routes in Galicia. The Route of the Camelia 2017 is highlighted not only by the beauty of this flower of oriental roots, but also by the great scenic power of the palatial gardens that compose it. Ever since the Portuguese navigators of the late eighteenth century imported this botanical species from countries like China or Japan, the camellia has become one of the most characteristic symbols of the exuberant nature that surrounds the pazos, one of the hallmarks of the Galician architecture. Precisely the first navigator to transport it from Asia to Europe in the 17th century, the botanist George Kamel, takes its name from this species, which over the years has occupied pages of works as famous as The Lady of the Camelias, by Alexandre Dumas, and has become one of the most famous icons used by the French firm Chanel for its elegance. The humidity, acidity and mild temperatures of the Galician land meant that, among all the floral species imported at that time, the camellia arrived to stay. The itinerary is formed by a dozen gardens in which there are about 8,000 varieties and that are located in localities that already have a tourist signage of their own that besides fulfilling a guiding function, officializes the relevance that these zones have in patrimonial level . Pazo de Mariñán. Located in Bergondo (A Coruña), on the banks of the River Mandeo and the Ria de Betanzos, this pazo has its origin in a fortress built in the fifteenth century that did not lose its military character until three centuries later, at which time Its architecture balustrades, sculptures, staircases and a garden that is divided in two halves: one of them with a yew tree, a madroño and diverse plantations of camellias and the other dedicated mainly to the roses, the azaleas and the ivy. Pazo de Santa Cruz de Rivadulla. This Renaissance garden located in Vedra(A Coruña), contains over 200 varieties of camellias, which share protagonism with magnolios, eucalyptus and centenary olive trees. Among the latter, which are located forming natural galleries, stands out a copy that in 2015 won the AEMO Award for Best Monumental Olive of Spain. Casa Museo de Rosalía de Castro. This is one of the cases in which the botanical beauty joins the charm of the home of one of the most important Galician women writers, Rosalía de Castro. The Camellia reticulata hybrida, which grows in her garden, has been named by her own name. The house is located in the town of Padrón(A Coruña) and is characterized by the prominence of the stone in each of its nooks and crannies. Pazo de Oca. Baptized as the “Galician Versailles”, this construction located in the protection of the Pico Sacro, in A Estrada (Pontevedra), is the most visited baroque style lord of all Galicia. From the beginning of its construction in the fifteenth century until now, the gardens that flank the pazo have evolved around an aesthetic in which the natural growth of plant species, typical of English landscaping, and a control over its expansion Has managed to retain its original geometry, inspired by the gardens of baroque France. Alameda de Santiago de Compostela. The most recognizable garden of the Galician capital is one of the landmarks of the city, as well as treasuring an extensive number of monuments of great historical value, it is the scene of numerous celebrations, among which is the Feast of the Apostle Santiago . Among its monuments, those dedicated to such personalities as the playwright Valle-Inclán or the poetess Rosalía de Castro stand out. Its origin is situated in the XVI century, time in which the Count of Altamira donated the lands to the city. 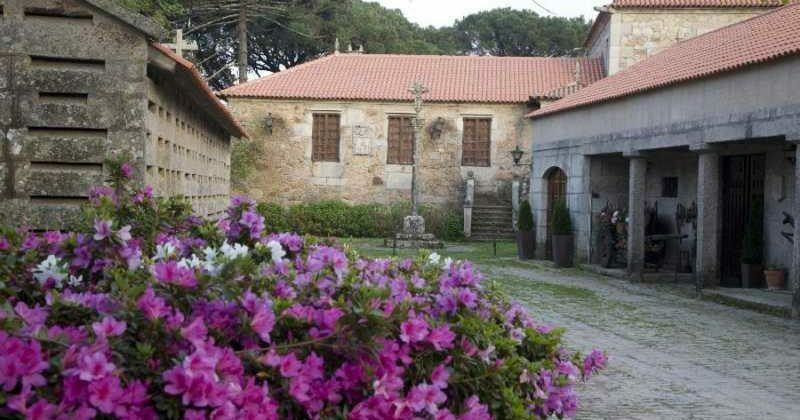 Pazo de Rubianes.This construction, dating from the Middle Ages, shares a founder with the town of Vilagarcía de Arousa, where it is located: Don García Caamaño. In addition to being one of the enclaves that are included within the Route of the Camelia 2017, the pazo is also present in the Route of the Wine of the Rías Baixas, since it has in its facilities a cellar of the century XV that conserves in its original state and that produces two modalities of albariño wine coming from its own vineyards. Pazo de Quinteiro da Cruz.This pazo is located inside the valley of Salnés, in the parish of in the city council of Ribadumia. This neoclassical manor house dates from the 18th century and has various romantic elements, gazebos, gardens, statues, sundials, two cruises and two granaries. Its gardens, of great botanical and ornamental interest, have a wide range of species, both native and foreign. They are surrounded by vineyards of albariño and a native forest, although the camellias charge the greater protagonism, blossoming about 5,000 copies of more than 1,500 varieties of different species. It has a winery where the albariño “Quinteiro da Cruz” is made. Pazo de La Saleta. Located in the town of Meis (Pontevedra), the estate was named after the chapel dedicated to the Virgin of La Saleta that Colonel Severo Perez Cardecid ordered to build in the mid-nineteenth century. Its garden, with a surface of 5 hectares, was born in the second half of the last century from the passion that the English marriage formed by Margaret and Robert Gimson had for the botany. Among the species that can be found in the vicinity of this pazo there are eucalyptus, oak, cork oak, rhododendron, azaleas and, of course, camellias, a species that led the Gimson to win the Golden Camellia. Pazo de Lourizán. The great architectural jewel of the town of Marín(Pontevedra) was first documented in the eighteenth century and, although the estate in which it is located dates back from the fifteenth century, acquired its current characteristics in the XIX, by hand Of a remodeling promoted by the jurist and politician Eugenio Montero de Ríos, that turned it into a palace of modernist style, surrounded by grottos, statues and a great variety of arboreal species, some of which is in the ‘Galician Catalog of Singular Trees’ as protected species. Castelo de Soutomaior. 2017 marks the fifth anniversary of the recognition of this castle’s botanical park, located in the municipality of Soutomaior (Pontevedra), as Garden of International Excellence by the International Society of the Camellia. In total there are 25 hectares that inhabit 22 species of camellias and trees from each of the five continents. Pazo Museo Quiñones de León. The parish of Castrelos, in Vigo, houses a garden fragmented in several areas depending on the particularities of each one of them. There is an entrance garden, a rose garden, a forest, a solarium, an English style garden and a French style garden. It is precisely in this last one where the most outstanding species is located: a camelio of 200 years. The lush vegetation is accompanied by various sculptures and galleries of shields. Parque do Castro. Located in a privileged point of the city of Vigo, from which you can see its port, its estuary and the Celtic settlement that gives it its name, this park has a great variety of camelias, mostly of Portuguese origin, as well as other Exotic species that increase its already great landscape, historical and cultural value..